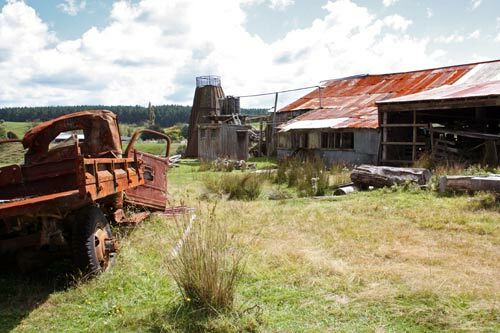 Endean’s mill, near Waimiha, is New Zealand’s sole surviving complete native-timber sawmill. The mill buildings were originally located in Mātīere but were removed to Ōngarue Stream Road, near Waimiha, in 1927. The mill operated until 1996. The complex feels as if it has been frozen in time because the buildings, equipment, timber, workers’ cottages and vehicles remain and have not been modernised, though the ravages of time are nonetheless obvious. This is the sawmill building. The conical structure behind it is the furnace where the scrap timber was burned.